The tradition of the Twelfth Man was born on the second of January 1922, when an underdog Aggie team was playing Centre College, the nation's top ranked team at the time. As the hard fought game wore on, the Aggies were forced to dig deep into their limited reserves because of injuries. Coach Dana X. Bible remembered that a former squad member, who was playing basketball at the time, was in the press box helping reporters identify players. His name was E. King Gill. Gill was called from the stands, suited up, and stood ready throughout the rest of the game… which A&M finally won 22-14. When the game ended, E. King Gill was the only man left standing on the sidelines for the Aggies. Gill later said, "I wish I could say that I went in and ran for the winning touchdown, but I didn't. I simply got ready and waited--just in case I was needed." This gesture was more than enough for the Aggie Team. Although Gill did not play in the game, he had accepted the call to help his team. He came to be known as the “Twelfth Man” because he stood ready for in case the eleven men on the gridiron needed him. 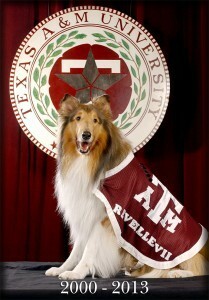 Reveille, the first lady of Aggieland, is the official mascot of Texas A&M University. As a Five-Star General, she is the highest ranking member of the Corps of Cadets. Reveille is the most revered dog on campus. Company E-2 has the privilege of taking care of Reveille. If she is sleeping on a cadet's bed, that cadet must sleep on the floor. Cadets address Reveille as "Miss Rev, ma'am." 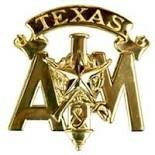 Texas A&M was established as a military institution. While participation became voluntary in 1965, the Corps of Cadets has played an important part in its history and development. The Corps of Cadets at Texas A&M is not just another ROTC unit that might be found at most campuses. The men and women of the Corps form the largest uniformed body of students outside the service academies. However, the Corps has more to offer than just military training. It is a tightly-knit group of students that offers camaraderie, as well as leadership training that is useful in all post-college careers. Although cadets can earn commissions as military officers, membership in the Corps itself carries no military obligation. In fact, only about 40 percent of graduating cadets are commissioned, while the rest pursue civilian careers.